Cars & Automotive will review and explore various automotive products, car models, car parts as well as garage tools and accessories. Michelin car tires are known for their good quality and durability. Sears is one store that carries a wide selection of Michelin tires such as Pilot Sport, Energy MXV4 Plus, Harmony and Weatherwise to mention a few basic models. These tires feature high winter traction and silica-based rubber compounds which help improve fuel economy. So if you're looking for a pair of tires that will match your car and stay in shape after many miles on the road, then Michelin is a great brand to consider. Sears carries many types of automotive products such as tires, batteries, charges, suspension, electronics and tools, and their prices are competitive and their selection is wide. "Michelin Pilot Sport tires raise the bar on handling and tread life and are designed to help you get the most out of your ultra-high performance sports car. Michelin Pilot Sport tires are summer tires, excelling on both dry and wet pavement." "Our best-selling, most popular touring tires, Michelin Energy MXV4 Plus tires are made with industry-leading, silica-based XSE technology rubber compounds that help resist wear, improve fuel economy, and hold the road. Michelin Energy MXV4 Plus tires offer a high level of comfort, an exceptionally long tread life." "For drivers of passenger cars and minivans who demand exceptional value, Michelin Harmony tires use the latest technology to help deliver a great balance of quality, features, and value in high-mileage all-season tires. Michelin Harmony tires also offer a very high level of winter traction." "80,000-Mile Limited Warranty. Quiet, Comfortable Ride. Sure Grip in Wet and Snow." A power inverter is great if you need to recharge or run various electronic devices from your car. Home Depot is one store that carries a nice selection of power inverters by Xantrex and Powerpack among other brands. One of these power inverter will allow you to recharge and run cell phones, laptops and camcorders among other things. These inverters also include cigarette adapters, voltage protection and built-in fluorescent light. Home Depot also carries other automotive related products such as garage organization pieces, car electronics and more. Home Depot features many well known, high quality brands and a large selection of various products for affordable prices. "The Xantrex is a dual outlet 320 watt continuous power inverter. It can provide 400 watts of power for up to 5 minutes, and 600 in brief surge or startup power. The Xantrex Plus includes a cigarette adapter, and cables to clip directly to your battery to allow the full output. 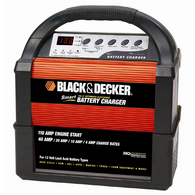 Features include voltage protection (battery output too high or low), audible alarm for low battery, overload protection"
"The rechargeable Powerpack 400 Plus delivers 400 watts of portable AC power and can run many household appliances, making it the ultimate product for power outages or outdoor activities like camping and fishing. 320 watts continuous power; 640 watts max surge power. Built-in fluorescent light. Overload and over-heating protection with audible alarm signals"
"Micro Inverter 175 is the smallest 175-watt power inverter on the market today. It incorporates high-frequency technology to convert power from a vehicle's battery (12-volt DC) into standard utility power (115-volt AC, 60 Hz). By plugging the Micro Inverter 175 into a vehicle's lighter socket, users can conveniently recharge and run electronic devices such as cell phones, camcorders, laptop computers, PDA’s, 13" TV/VCRs and computer games"
"1500 watts continuous power 1750 watts for up to 5 minutes 3000-watt max surge power for devices that require more power to start Easy to read digital display indicates DC battery voltage Automatic shutdown protection against overload, over temperature and low battery conditions LED bar graph displays outlet power (2) 3-prong and (1) 2-prong AC receptacles for connecting multiple loads 1-year warranty"
If you're looking for a reliable and functional GPS system to guide you in the car, then Tom Tom GPS might be worth checking out. Home Depot is one store that carries a nice selection of Tom Tom GPS systems such as Auto navigation systems and portable GPS units. These GPS systems will show you detailed maps and give you clear voice prompted directions. Home Depot also carries other automotive related products such as garage organization pieces, car electronics and more. Home Depot features many well known, high quality brands and a large selection of various products for affordable prices. "TomTom, the world's largest portable navigation solutions provider excels with its new high-end flagship model, the GO 920. The device comes preinstalled with complete maps of the United States, Canada and Europe on the 4 GB of internal memory. The GO 920 includes new Enhanced Positioning Technology for a more continuous navigation experience." "The TomTom NAVIGATOR 6 is the easy to use navigation solution for your PDA/mobile. Yes, that's right--TomTom navigation software on your PDA/mobile! It provides detailed maps of the United States and Canada that are clearly and accurately displayed (both spoken and visual) without interfering with your phone's normal operation. " "Easy to install and use: The simple installation with TomTom HOME will get you on the road in minutes. The intuitive user menu gives you the perfect navigation experience. Detailed maps of the US and Canada: Door-to-door navigation across the United States and all Canadian provinces and territories. Clear and accurate spoken and visual instructions"
"The GO 720 is a sleek-looking and well-performing in-car GPS that brings a new Map Share community tool that gives you access to constant map updates for more accurate information, and a new safety option called Help Me aids you in case of an emergency. It's compact at 4.6 inches wide by 3.2 inches tall by 0.9 inch deep and 7.7 ounces, so you certainly won't have any problems transporting this unit between cars." 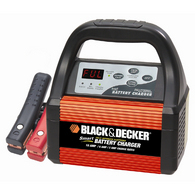 A car battery charger is great for a variety of applications. 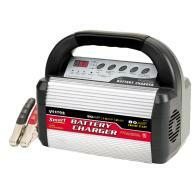 If you're looking for a battery charger, then Lowes is worth checking out. Lowes carries a couple of car battery chargers by Vector and Black and Decker. These chargers are great to have around no matter whether you need to jump start an engine, fill up a tire with air, or perhaps you just need some emergency lighting. No matter what, Lowes is a great store to visit if you're looking for automotive tools or equipment. Their selection is quite small, however their prices are affordable and they carry a nice variety of well known quality brands. "Automatic temperature compensation. Digital display shows charge rate, operating mode, fault codes and FUL when charged. One minute engine start. Nickel coated clamps"
"Battery and alternator voltage check. 4 minute charge to start (bulk charge/rapid start). Spark resistant reverse polarity and short circuit protection for user. Float mode and automatic charging"
"Digital display shows charge rate, operating mode, fault codes and FUL when charged. 1 minute engine start (bulk charge/rapid start). Built-in battery reconditioning. Reverse polarity indicator"
Those who want to make their car look extra sharp might appreciate these Cruiser license plate frames from Target. 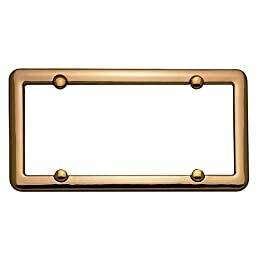 These decorative license plate frames come in many looks such as stainless steel, gold and chrome to mention a few. What a great gift this would make to the person who has everything. 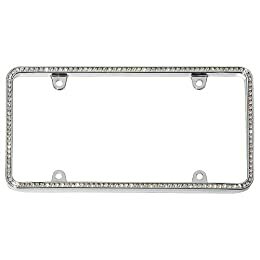 These license plate frames are easy to install and they would certainly create a distinctive look. Target does actually carry quite a nice selection of automotive products such as car electronics, car interior accessories, garage items and more. So if you're looking for car products, then Target is a good place to check out. "Beautifully polished gold frame gives your car an extra sparkle. Unique design creates a distinctive look. Easy to install. 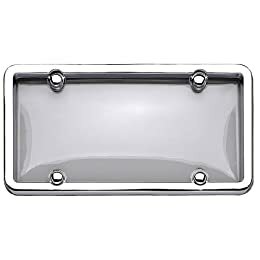 Makes a great gift for those who want to make their car look sharp"
"Enhance your car’s appearance with this attractive license plate frame. Acrylic bubble shield for extra protection. 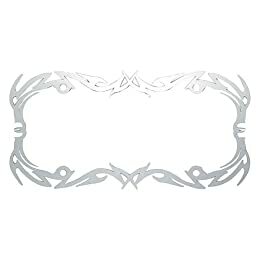 Comes complete with 4 screw covers to provide a finished look"
"Laser cut from stainless steel and polished to a reflective shine. Unique design creates a distinctive look"
"Beautifully polished 24-karat gold-plated frame gives your car an extra sparkle. Comes complete with 4 screw covers to provide a finished look"